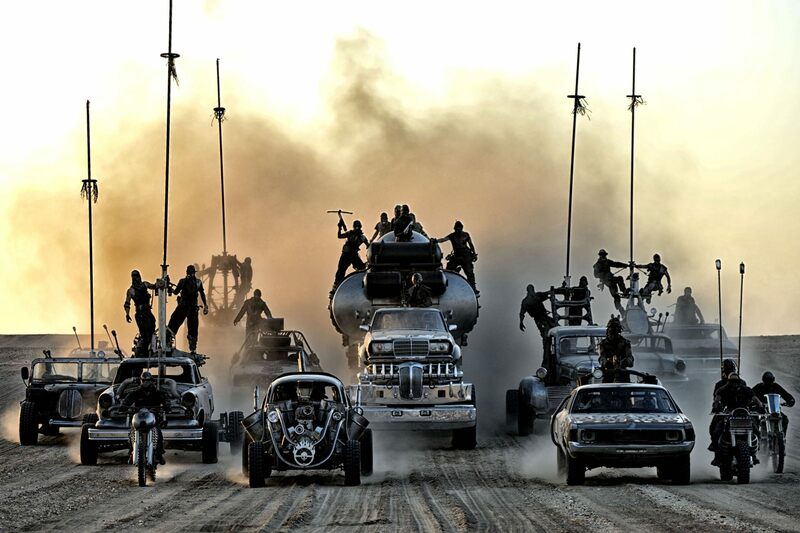 The Mad Max franchise is solid gold. Well, assuming that you’re a fan of psychotic Australian post-apocalyptic action films, but really who isn’t? This series of films has more than a cult following, which would only secure its place as a very weird yet very popular niche movie. No, it’s more than that; loved by critics & audiences alike, defining an era, launching a career, and cementing itself as more than one-of-a-kind. Or three-of-a-kind, more accurately: Mad Max, Road Warrior, Beyond Thunderdome. These are movies that you must see, must know, and need to appreciate, if not exactly understand. Fury Road is no different, another epic survival tale following our hero, the lone wolf of the wasteland. But it’s been 30 years since director George Miller last attempted this continuing saga, you wonder if there might be some rust. Well, wonder no more. There isn’t. In the desert of a blighted land, every man is crazy. You’d have to be to survive, to do what it takes, to kill or be killed, to push yourself (and your car) farther than you ever thought you could go. For Max, life is a harsh reminder of the past, of ghosts that will never leave him in peace. Oh and evil rovers on suped up dune buggies, those too. Max’s newest enemies are the War Boys, led by Immortan Joe, a tyrant of the Citadel who controls the water and therefore controls the people. His obsession is clean offspring, sons free of the diseases inherent in the world, and so he prizes his beautiful breeders above all else. But they’ve just gone missing, freed by the iron-willed Furiosa, who will now team up with Max to get the girls to safety, find the legendary Green Place, and rid them all of the guilt of living when so many have died. 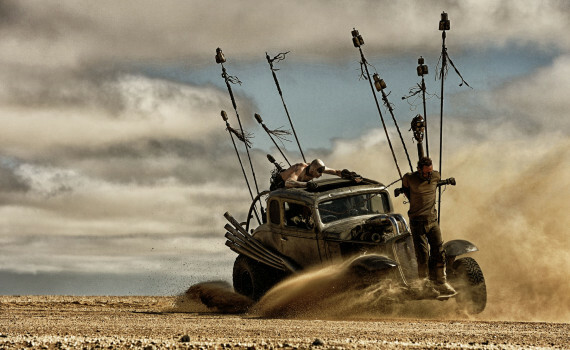 Fury Road is one colossal action sequence with a few scattered moments of humanity. Twisted humanity, barely humanity, a mind-boggling alternate dystopic version of humanity, but humanity nonetheless. And as someone who doesn’t like action movies, you’d think the never-ending, heart-pounding, explosion-laden action would turn me off from loving this movie. But they didn’t, and there’s a simple reason why; because they were crafted by a genius. George Miller may only do one thing well, but he does that thing so well that he becomes a little action god who can literally do no wrong. The constant violence & insane pace of this film are parts of the Mad Max world he creates, not something manufactured to impress audiences. And so the action feels natural in a way in can never feel in other films, regular in a world gone mad, typical for the lives of the people who are unlucky enough to still be alive. Every minute is filled with death & drama, yet it never gets old. I’d call that genius, wouldn’t you? Perhaps you expected to love this movie, as I did, expected to dig the action, the fictional world, the odd language, the accents, the dust, the gas-guzzling pseudo-vehicles. But what I didn’t see coming was Charlize Theron. I knew she was in the movie, thought she’d play a part in the story, but I didn’t expect her to be the main character. And in a movie whose title comes from Tom Hardy’s role, why would I? But she was undoubtedly the lead. It was her drive, her motivation, her heart, that kept the plot going. Max became a narrator in a sense, a tool in the mission, but not a person that the movie relied upon. 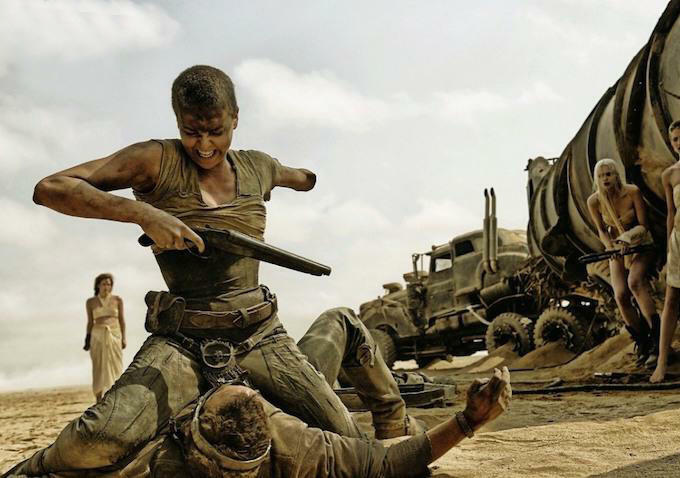 So Furiosa became the heroine, with Max as her sidekick in a strange way, and what’s most surprising is that it worked. Had Hardy been the only focal point perhaps we would have lost interest, perhaps we wouldn’t have been able to keep ourselves from comparing him to Mel Gibson, perhaps we would have had a been-there-done-that feeling. It’s hard to predict, but what I know is that Miller got it right. He brought the franchise back to life, gave us the pieces we always loved, twisted the frame of the story just enough, and turned the volume up to eleven.